I read (= recorded as read) 101 books this year. I know there are some I didn’t catch (mostly non-fiction) and nearly 40 of the books are category novels, but all in all, and thanks to the huge effort in December, I managed to read over 100 books. Yeah! Karen Templeton – Yours, Mine…or Ours? The fact that decided it was that I didn’t think I would like The Prince of Midnight all that much before I started to read it (the cross-dressing heroine). I also don’t remember much about Jennifer Crusie’s Manhunting. But I gave it a 5/5 so it’s on the list. I got really into category novels this year. I like that they are fast to read and focused on the romance – a good way to fix my contemporary romance cravings. But most of all, I really appreciate how authors manage to turn out good stories with all the constraints on this format. The most pleasant surprise: that I like Kresley Cole’s “Immortals After Dark” series after all. Looking at all the books and the grades, I have really a lot of books graded in the 4/5 range. Maybe I’m too generous, I don’t know, but grading is probably something I have to think about (once more). and started/played ? number of others, most notably Civilization IV (PC), Divine Divinity (PC), Spell Force (PC), Puzzle Quest (PS2), and some Diablo 2 (PC) and Civilization III (PC). It’s one of my most favorite games on the PS2. It’s beautiful and original. Okami contains a lot of references to Japanese mythology. You play the wolf incarnation of a Japanese sun god, Ameratsu, and your task is to get rid of the evil that came over the world and restore the world to beauty again. For that, you have to regain your magical powers which you wield with a paint brush and (that’s for the most part optional) fight demons on the way. To lighten things up you’re accompanied by a side kick character, Issun, who looks like a small bug, rides on your back, and does the talking. The paint brush thing is what sets Okami apart from other games in the use of magic and makes it fairly original, IMO. For example, you can restore broken objects and make trees bloom by going into paint modus where you pause time and paint on the screen using the game controller. This may sound complicated or difficult, but it isn’t. 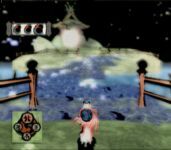 In fact, the controls are easily learned and smooth and that makes Okami fun to play. Although the game is linear in that certain areas are only accessible after you did certain things, there is a strong focus on exploration in this game with all the extra stuff to find and do. Learning a new (brush) technique often means you can go back to already visited and restored areas and then do things you couldn’t before like digging on different ground. You also feed animals and help people with things. For that, you get praise which you use to improve yourself (for example, you can store more ink or money). I don’t know what to say. I liked the water-colour painting look. And when you restore an area back to life and all the green and flowers spread and cherry blossoms floated through the air – just beautiful. Just letting Ameratsu run around and see more and more flowers swirl behind her the faster she runs is fun. There are quite a few side quests to do so you can take a break from the actual story line when you want and go fishing or go looking for objects. I just like to have some extra stuff in a game. I liked that I had to figure out how to beat them. Just smashing buttons wouldn’t do for most fights. There is a strategic element involved in that you first have to get the enemy to a stage where you can attack him (smash the button) and often it involves the use of the paint brush techniques. Once you figure that out, the boss fights get rather easy. 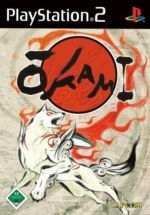 Despite the rather dark story, Okami is actually a rather hopeful and cherry game, IMO. It easily is one of the best, most original and most beautiful games I played on the Playstation 2 with a near perfect balance between its elements. Did I enjoy playing this game? Yes. Formatting and re-formatting and re-formatting again my posts after my switch to WordPress, I realized how long ago I posted comments about a game I played: it was back in February 2007 (Dragon Quest VIII)! Since then, there are only 4 more posts I put in the category “games.” That has to change (after all, I kept the “Books and Games” title for the blog). I searched some time for the “right” video – not that this was a problem for me – but they all seemed to focus on things that didn’t convey what makes this game so special in my eyes. 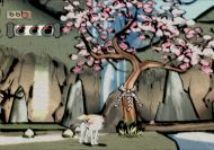 Watching the videos, even the one I finally choose, Okami looks like a rather dark game, focusing on fighting and with muted colours. But actually, I think of it as a rather bright, cheery, hopeful and – above all and strange as it sounds – peaceful game. You don’t have to fight if you don’t want to except for “boss-fights” and often the colours are actually brighter than they appear in this video. 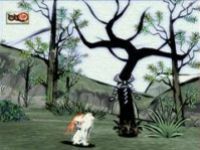 Okami is different than other games with its combination of story, gameplay and graphics. I really like it. I settled for this video because there are hints about the story and a rudimentary explanation of the gameplay.